A combination of law-enforcement personnel, aircraft, and K-9 units have descended on the small town of Friendship in southwestern New York after what police are calling a "significant sighting" on Saturday of two men matching the description of escaped murderers Richard Matt and David Sweat. According to the New York Times, a woman driving by a railroad track near the town noticed two men emerging from the woods who then reacted suspiciously when they saw her. One man "dove" back into the woods and the other tried to hide his head inside a hooded sweatshirt. One of the men also reportedly had red hair, as does Mr. Sweat. 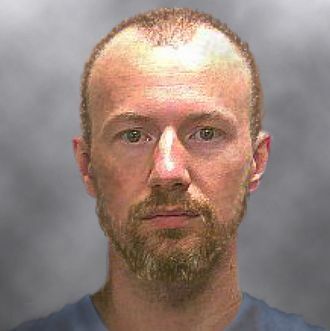 Friendship, in Allegany County, is less than ten miles north of the Pennsylvania border and 350 miles southwest of the maximum security prison the two convicts escaped from just over two weeks ago. It is also now effectively under lockdown, as police officers on Saturday asked many of the town’s roughly 2,000 residents to stay in their homes while the search is conducted, and non-residents were reportedly being stopped from entering the town at all. As of Sunday morning, the Albany Times Union notes that authorities report there have still been no confirmed sightings of the fugitives, though the manhunt, now with daylight once again on its side, is ongoing. On Friday, state law enforcement officials announced that one week ago they had received two reports of sightings of men matching the description of the fugitives, also in the southwestern part of the state. One sighting was by a railroad near the town of Erwin, and the other on a road near the town of Lindley just above the Pennsylvania border. Both those sightings were about 50 miles east of Friendship. Are Police Closing in on the Escaped Convicts?